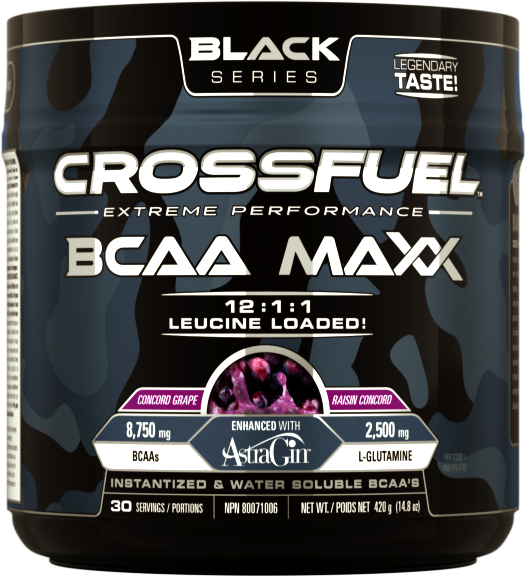 CROSSFUEL™ BLACK SERIES BCAA MAXX is simply everything you need in an amino acid formula with unmatched, mouth-watering flavour! Leucine loaded – a 12:1:1 BCAA ratio means an industry leading, massive dose of the critical amino acid L-Leucine – the most sought after BCAA for building muscle, increasing protein synthesis and improving recovery. BCAA MAXX is further enhanced with a researched dose of AstraginTM/MC, shown to dramatically increase uptake of BCAAs, along with the super amino acid L-Glutamine. Building muscle has never been this delicious! 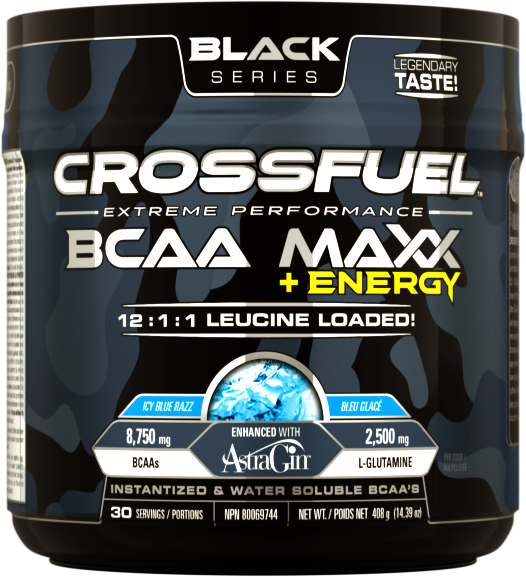 CROSSFUEL™ BLACK SERIES – BCAA MAXX + ENERGY is simply everything you need in an amino acid formula with unmatched, mouthwatering flavour! Leucine loaded – 12:1:1 BCAA ratio means an industry-leading, massive dose of the critical amino acid – L-Leucine – the most sought after BCAA for building muscle, increasing protein synthesis and improving recovery. BCAA MAX + ENERGY is the most sought after BCAA for building muscle, increasing protein synthesis and improving recovery. BCAA MAXX + ENERGY is further enhanced with a researched dose of Astragin™, shown to dramatically increase uptake of BCAAs along with the super amino acid L-Glutamine. New BCAA MAXX + ENERGY now gives you an added burst by supplying 200 mg of caffeine. Power through even the toughest workouts or simply get a muscle-building boost… anytime. Building muscle has never been this delicious! CROSSFUEL™ BLACK SERIES WEAPON What’s in your arsenal? Clinically researched key ingredient and performance driven, WEAPON pre-workout complex is a high octane, relentless, energy experience all delivered in just one scoop! Featuring the cutting-edge new energy molecule TeaCrine® (branded Theacrine), WEAPON primes your system for extreme muscle performance and next-level endurance. L-Citrulline, Agmatine Sulfate, Creatine HCL, and Beta-Alanine all contribute to one of the most advanced formulations ever developed and a workout experience like never before. 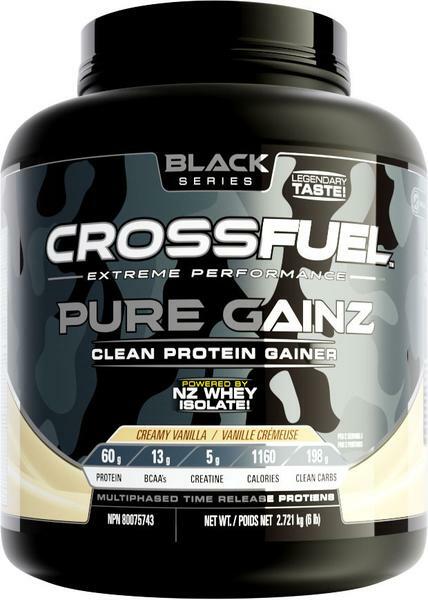 Geared to drive anabolic muscle-building to the next level, Pure Gainz delivers 10 slow & fast acting protein sources including New Zealand Whey – the cleanest biological protein source on the planet. If you want to grow muscle, you need an abundance of nutrient dense, useable calories. Not sugars and junk! New Pure Gainz from Crossfuel is loaded with clean, food sourced carbohydrates, l-glutamine for recovery and is very low in refined sugars. Precise levels of calories and amino acids from multiple sources are mixed with creatine to help the body create more lean muscle…FAST! CROSSFUEL™ BLACK SERIES RIPPED TFX Results you can feel! Introducing RIPPED TFX, perhaps the most groundbreaking innovation in energy and weight management supplementation ever. RIPPED TFX unleashes new theacrine (as TeaCrine®) an unrivaled sensory and energy molecule that helps temporarily relieve fatigue while promoting endurance. A key ingredient in RIPPED TFX is clinically shown to deliver 10 lbs of weight loss in 60 days! * Ripped, energized and ready, RIPPED TFX accelerates the process of “thermogenesis”, the process of turning calories into heat and energy. *In a study, overweight subjects (BMI > 25 kg/m2) consuming 400mg/day of green coffee bean lost twice as much weight as subjects taking a placebo (10.9 lbs. vs. 5.4 lbs.) in 60 days. All subjects reduced their caloric intake by 500 to 800 calories daily during the study. 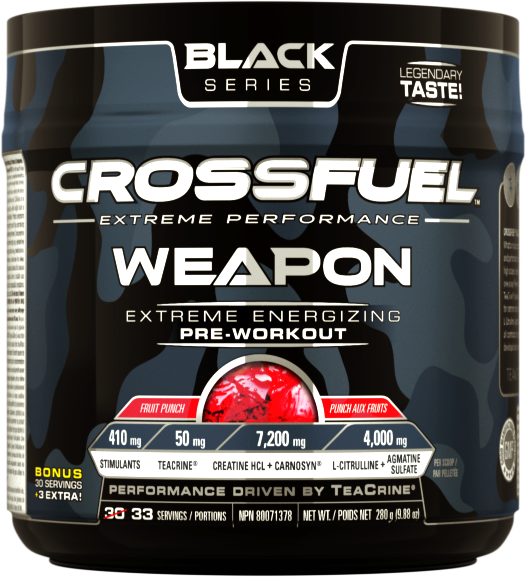 CROSSFUEL™ BLACK SERIES TEST MAXX Cutting edge, fast acting and research driven, TEST MAXX features the amazing ingredient KSM-66®, a potent extract of the exotic South Asian herb, Ashwagandha. KSM-66® is validated in clinical studies to show a significant increase in free testosterone released into the system rapidly! With 200 mg of DIM, estrogen is balanced and regulated so there is more active testosterone available to the body. With precise doses of Maca Root and Stinging Nettle, two effective LH stimulating compounds, TEST MAXX sets a new standard in male performance.